One of my favorite things about yoga is that the practice is not confined to a certain place. You don’t have to be in a studio, gym, or at home to roll out your mat. Grab a blanket or a towel and you can have an equally amazing practice outdoors somewhere. I’m absolutely biased, because I live in this amazing city, but if you are visiting San Francisco there are so many stunning places to practice outdoors. Not only is it a great chance to exercise, you’ll be able to do some amazing sightseeing as well. So whether you live here, or are just here for a trip, here are the three most beautiful places to do yoga in San Francisco. Want to get away from the busy city streets, crazed tourists, and just relax? Head out to Ocean Beach. This wide stretch of sand is dog, jogger, and bonfire friendly with the added bonus of an amazing view out to the Pacific Ocean. The beach is quite long and has lots of nooks and crannies to find your perfect practice spot. 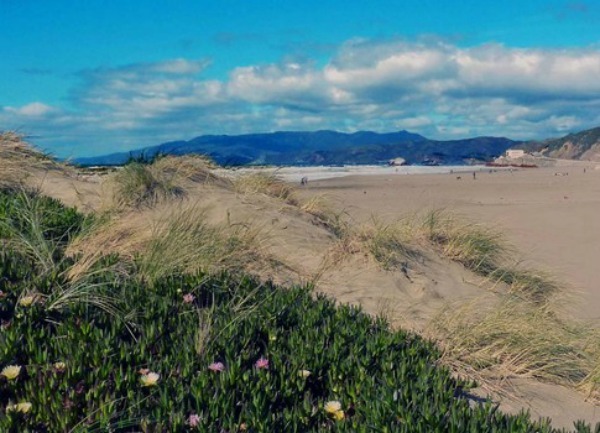 Tuck yourself in by the sand dunes at the end of Golden Gate Park, or by the cliffs underneath the Cliff House Restaurant. This won’t be the most peaceful practice, but you will be able to soak up the awesome energy of this local beach and the beautiful view! 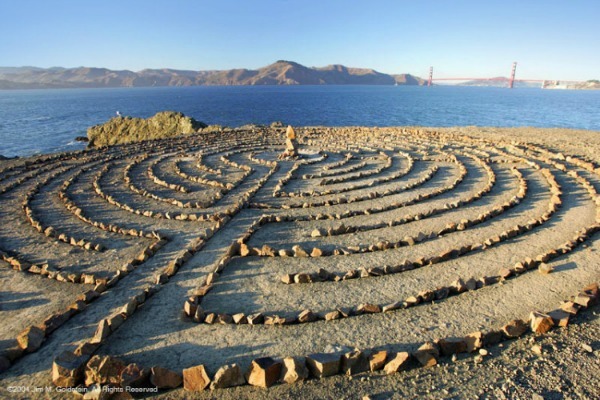 While you’re over by Ocean Beach, scoot up the hill to the Sutro Baths where you can follow the Lands End Trail out to Eagle Point Labyrinth. This trail follows along the edge of the cliffs and pops out on a cozy ledge with a stunning view of the Golden Gate Bridge. You’ll know you’re in the right place when you find the giant maze made of stones. Find your center and strike Tree Pose as you soak up the breathtaking view of the bridge and surrounding mountains. Talk about serenity! If you find yourself walking through the park on a Saturday or Sunday morning, you’re bound to see couples out running, dogs chasing stick, groups of people doing Tai Chi amongst the trees, and of course yogis. When I first moved to the city, I was amazed that so much wilderness was packed into a park in the middle of a city. There are fields, gardens, museums, mountain biking trails, and even roaming bison. With all of the open space and amazingly well kept landscaping, the hardest part will be choosing the best place to roll out your mat. I suggest entering at 9th Ave and Lincoln. On your right, across from the Botanical Gardens, you’ll find a baseball field with lots of open space surrounding it. Or you could walk a bit further, past the museums and tennis courts on Nancy Pelosi Drive, to find a lovely white Conservatory with flowered lawns. After you’re through practicing, this is the perfect place for an afternoon picnic. San Francisco is such a cool city that provides its visitors with a unique combination of architectural marvels and nature landscapes; a true outdoorsman’s city. While it’s exciting to try a new yoga studio, you’d surely miss out if you left San Fran before having an outdoor yoga session. These three sites are not to be missed, so grab your leggings, mat, and a camera. You’ll definitely want to capture the view while finding your inner peace. Where do you like to practice when visiting San Francisco? Share with us below!